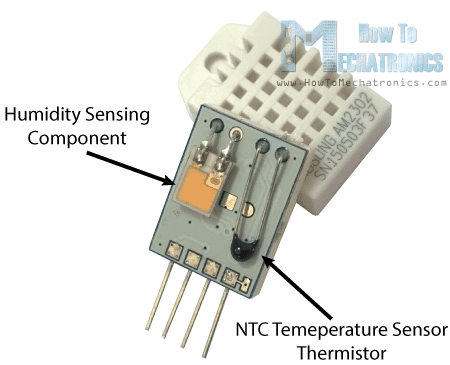 This mini-project covers the functionality of a DHT11 humidity and temperature sensor module. It is an accurate and inexpensive sensor that has an ADC to convert analog values of humidity and temperature. The 8-bit microcontroller in the sensor is used for data conversion. It provides reliable output results when the ambient humidity in the range from 20% RH to 90% RH, and a temperature range of 0 ° C to 50 ° C. It is good for most home and everyday applications. The expected data outputs can be seen on the serial monitor of the Arduino and the LCD so that you can compare the two. How does a DHT11 work? It consists of a Humidity Sensing Component, an NTC Temperature Sensor or Thermistor, and an IC on the back side of the sensor. To measure the humidity, two electrodes with a moisture holding substrate determine the humidity. As the humidity changes, the conductivity of the substrate changes or the resistance between these electrodes changes. This change in resistance is measured and processed by the IC which makes it ready to be read by a microcontroller. As shown in the image above, the pins of the LCD have different functions. Pins 1 and 2 – These are the ground and 5V source pins to power up the LCD. Pin 3 – It’s connected to the middle leg of a 3-pin trimmer resistor/potentiometer to adjust the LCD brightness. Pin 4 – The register select is usually connected to the microcontroller, in this case, the Arduino, to shift between command/data register. Pin 5 – It’s used to read/write the data. If you’ll only use this to write data to the LCD, you connect it to a ground. Pin 6 – It’s connected to a microcontroller pin to toggle between 1 and 0 for data acknowledgment. Pins 7 to 14 – These are the 8-bit data pins connected to the microcontroller to send data. You can also use it in a 4-bit mode by only using 4 of these 8 pins. In my case, I only used pins 11-14. 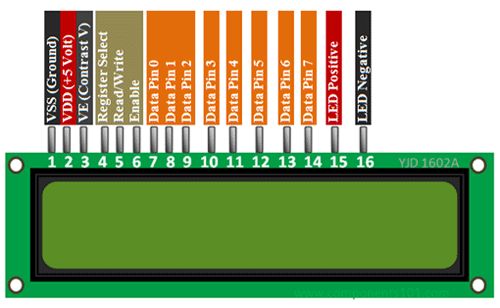 Pin 15 and 16 – These are the backlight LED pin positive and negative terminal respectively. DHT11 measures relative humidity. Relative humidity is the current density of water vapor in air vs the density of water vapor at saturation point. At the saturation point, the air is full of water vapor and can’t hold more water anymore, resulting in a dew on surfaces of objects. 100% RH means that the air is full of water vapor. In contrary, 0% RH means that the air is dry. The wiring diagram is kind of a bit confusing but the details for pin configurations of the LCD and DHT11 are indicated in the notes in the picture above. Some DHT11 devices have 4 pins and 3 pins. I used a 3-pin DHT11 since it is now integrated into a module, just like what I’ve used. The 3rd leg in a 4-pin DHT11 is a null pin which doesn’t require a connection. This library allows an Arduino board to control LiquidCrystal displays (LCDs) that has a Hitachi HD44780 (or a compatible) chipset, which is found on most text-based LCDs. The library works within either 4- or 8-bit mode. Copy the code below into your Arduino IDE and press the upload button. Arduino code is from Adafruit website. Some parts are edited. This defines the connection of the Out pin (DHT11) to the Arduino pin connected (pin 7). It also defines the type of DHT sensor that we’re going to use which is DHT11. 5, 4, 3, 2 = LCD Data pins are connected Arduino pins 5, 4, 3, and 2. DHT dht(DHTPIN, DHTTYPE) is a function that calls the DHT11 sensor through the pin 7 of the Arduino. There you have it! A simple humidity and temperature sensing project that can be assembled and played within 5 minutes. LCD is a good device to display data or messages instead of having to check your serial monitor every now and then. You can compare the data output in the serial monitor and the LCD. Click the magnifying glass on the top right of the Arduino IDE to display the serial monitor window.